Favourite Song: Poem #76 Over the wide sea As I sail and look around, It appears to me That the white waves, far away, Are the ever shining sky. 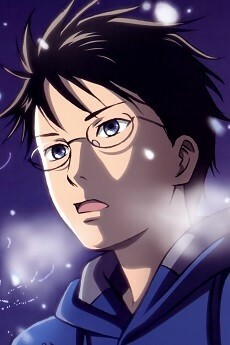 Arata Wataya was a transfer student from Fukui that went to Chihaya's elementary school. The grandchild of a master karuta player, Arata inspires Chihaya to take up karuta by telling her that he thinks she has a talent for it. He had difficulty fitting in at Chihaya's elementary school because of his Fukui dialect and his family's poverty. He's passion for karuta is inspired by his grandfather, a Meijin (master). After their first game at Arata's house, Chihaya befriends him. His dream is to become a karuta Meijin. After graduating elementary school, he returned to Fukui to care for his sick grandfather. He stops playing karuta because his grandfather died while Arata was competing in a karuta tournament to rise to A-rank. However, after Chihaya and Taichi visit him in Fukui, he regains his resolve to play competitive karuta again.